For sale is a set of 2 leaded crystal 24"% hand cut goblets with a diamond and thumb print design. These crystal goblets are in beautiful condition with zero cracks. These are 2 heavy glass flower cut beverage/drinking glasses. About 3-7/8" H x 3.5" W at top opening. Very nice glasses in very good condition. Set of 2 Drinking Glasses. I do not wash it or not I clean these. You get it in the original condition. so we can together resolve the situation. Taller glasses measure 4" tall by 3" across open end. 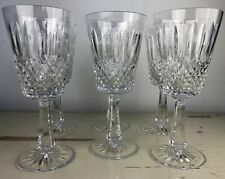 Gorham Hand Cut Full Lead Crystal Drinking Glasses Set. PRICE DROP - Was $65.00 -Beautiful Gorham Hand Cut Full Lead Crystal Drinking Glasses. Set of 6 and 1 to spare. Discontinued Victoria's Garden Pattern. Ribbed with etched flowers in Poland. Approximately 10 oz. Capacity. Gorham "Primrose" crystal beer/cold drink goblet.Cut leaves ,multifaceted stem. Excellent for beer, cold drinks or iced tea. Heavy crystal, nicely cut with three leaves around the bowl, the stem is multisided. It is 8 1/2" tall or holds 12 oz. This glass is in very good condition. 6 1/2" TALL BY 3" WIDE AT RIM. SET OF THREE. CUT GLASS/CRYSTAL(?). CUT DESIGN. Very unusual. Couldn't find them anywhere and don't know the maker. THIS BEAUTIFUL GLASS IS DONE WITH FULL DESIGN WORK OVER THE GLASS WHICH APPEARS TO BE A DRINKING GLASS BUT IS SO ELEGANT ONE CAN ONLY GUESS AT ITS PURPOSE. THIS IS AN ESTATE ITEM HELD IN AN ASIAN MARKED BOX. 6 Vintage Etched Hand Cut Crystal Wine Drinking Glasses 5.5" Capacity 6 oz. Drinking Glasses. Set of 6 Crystal Pedestal Wine. Hand Cut and Etched. Cave of Treasure. 5.5" tall and 6 oz. I do not wash it or not I clean these. You get it in the original condition. P urchases must be completed. This is a beautiful set of FOUR full lead crystal drinking glasses handblown & cut for Block Portugal! Handblown & Cut for Block Portugal - Atlantis. Holds: 10 ozs. Set of 4 Full Lead Crystal Drinking Glasses. ONE Villeroy & Boch crystal water/cold drink goblet.Vertical cuts. Pattern Vivo. Vertical cuts. Pattern "Vivo". This pattern was discontinued around 2000. Elegant gray vertical cuts open up around the base of the bowl as flower petals. 7 3/4” tall. These were purchased from Marshall Fields in the 1970s. They are in excellent condition. 6 Vintage Crystal Cut Goblets Large Stemware Drinking Wine Glasses EXCELLENT WOW. Condition is Used. 4 Vtg New Yellow KAYAK Hering Hand Cut Led Crystal Drinking Water Glasses 7"
Amazing 7" tall full led Crystal handmade hand cut Drinking glasses in a very rare color of yellow. Vanity Glasses. 2 sets of 2 Fine Hand Made Crystal Glasses. FOUR EXTRA HIGH QUALITY GLASSES. You get 4 Glasses total. YOU GET ALL 4 GLASSES AS SHOWN IN PICTURES. EACH GLASS HOLDS 8 OZ OF LIQUID. The more you buy, the more you save. 6 3/4” tall. These were purchased from Marshall Fields in the 1970s. They are in excellent condition. 6 Vintage Crystal Cut Goblets Large Stemware Drinking Wine Glasses EXCELLENT WOW. Condition is Used. They have the original paperwork from JCPenney. They are all in like new condition. Condition is excellent gently Used. I will describe everything to the best of my ability and capture any after market imperfections with photographs. These photos might not represent the actual size of the item. This lot is for 2 sensational Crystal glass Hock wine drinking goblets. No Issues in great condition. (1) Crystal Pitcher w/(1) Crystal Decorative Plate. (8) Crystal Goblets. This Drinking glass is in excellent clean condition. Great color and detail. Rare 1930's. You are buying 1 glass. Set of 2 - Clear cut crystal Tall Formal Drink Stemare. Excellent, NEAR MINT condition! A beautiful set that will make a fine addition to any beverage service or glassware collection! We respond to all issues within 24 hours.